Black Spider by Cloma Pharma Review – Does it work? Among the growing number of ECA stack supplements, Black Spider promises to help eliminate fat fast without having to worry much about exercise. ECA Stack supplements have three major ingredients that contribute to the fat burning effect, namely Ephedrine, Caffeine, and Aspirin. These three ingredients have been proven to induce a thermogenic effect that helps you burn fat faster. Black Spider warns users of its potency. According to its clearly-printed warning on the label, it’s highly dangerous to take more than the recommended dosage of Black Spider. Considering the effects of Black Spider, we’re more than likely to believe that this warning is nothing more than a marketing ploy to lure customers who are willing to take risks just to lose fat fast. Dangerous or not, we cannot discredit that some supplements are dangerous if abused. In this review, we’ll take a closer look at Black Spider to see if the risk is worth the reward. Like any other supplement with an ECA stack, users would first notice the effects of caffeine on their body. Caffeine Anhydrous, a powdered version of caffeine, provides a temporary boost of energy and alertness. Caffeine’s effects don’t come without some drawback. In some cases, users reported cases of side effects that include shaking, anxiety, palpitations, and angina. Caffeine combined with other energy boosting ingredients works OK, especially if taken during pre-workouts. Some users have experienced jitters and caffeine crashes shortly after taking Black Spider. Since Ephedra is banned in many areas, you should be concerned with any supplement that contains an Ephedra extract. Caffeine is known to put ephedra’s side effects into overdrive. ECA stacks still work as long as the ingredients are within safe levels. Without the exact dosage, taking an ECA stack will put you at risk for getting serious side effects from ephedra and caffeine. It would have helped if Cloma Pharma included the exact ingredients, especially for their ECA proprietary blend. Determining the risk factors could be carefully examined if the details about “Eph Extract” and caffeine were clearly explained. 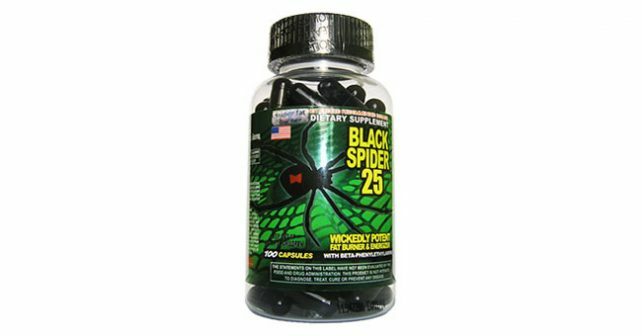 Black Spider’s thermogenic blend also has Yohimbine, which is known as a vasodilator with aphrodisiac effects. This improves blood flow by opening up your blood vessels. Yohimbine makes erections better by making it easier to maintain. Yohimbine combined with aspirin, which is a blood thinner may cause problems if not properly used. If you have recently undergone any surgeries, or if you suspect that you have gastric ulcers, consult your doctor first before using this product. Hiding ingredient concentrations under proprietary blends may make sense if the ingredients are harmless. However, for a supplement that has potentially-dangerous ingredients and combinations, it would help if there were complete details about the product so customers can make an informed decision.